[Review] Age of Hannibal | Glory Eagles de l'Empereur! 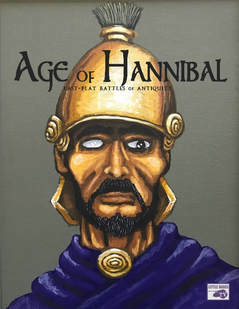 Those who read my last post will know all about littlewarstv and their youtube channel, and will have seen me mention a new game they’ve just released (well, earlier this year), Age of Hannibal. Having watched the videos they’ve produced about the rules, and the game they played using the rules based on the battle of Trebia, I was intrigued and got in touch with Greg Wagman, the rules’ author and one of the mainstays at littlewarstv. The result of that conversation was a nice shiny pdf (they’re also available in hardcopy) of the rules winging it’s way through the ether to me, and after a brief delay due to a family bereavement, this review. Age of Hannibal is described as “Fast Play Battles of Antiquity,” which immediately gave me a shiver of doubt – rules that emphasise fast play have often fallen into one of two camps – not at all fast playing, or so simplified that there’s no flavour and thus a thoroughly unenjoyable game either way. I’m happy to relate that Age of Hannibal doesn’t fall into either of these categories, but actually does what it says on the tin. Me and a quickly-roped-in mate had a small battle using the rules to test the waters (no pics in this one I’m afraid, we used bases with unpainted minis stuck to them to play, and all rules deserve painted figures at the very least for proper battle reports), and both liked what we saw. I’ll mention bits of our game throughout the review. The pdf is compact (41 pages, including the striking cover pictured above (which was painted by one of the other littlewarstvers), and including a 2 page QRS and some terrain / stratagem cards (more on those later). The rules themselves are based on Chipco’s Fantasy Rules! which was another thing that made me go hrrm for a second (regular readers will know of my dislike for fantasy and scifi wargaming), but Greg just uses the underlying system and mechanics (dutifully licensed from Chipco); the rules are at least as historical as other ancients wargames out there. Rather than cover the entirety of both the ancient and medieval worlds, like most “ancients” wargaming rules do, going from Biblical to Italian Renaissance without a second thought, Age of Hannibal focuses on a smaller and tighter arena (can you guess which period?). They do still cover quite a large range, from the Peloponnesian War to the fall of Rome, but the major emphasis is on the Punic Wars and Successor Wars (that’s certainly what I’ll be using them for). These are not yet another skirmish game for a couple of dozen 28mm figures either, but intended for the large battles of the era, Cannae, Zama, Alesia and the like, and not just some small part of the battle, but the battle in its entirety. As is often the case these days with large scale battle rules, basing is by stand rather than by individual figure, with each stand depicting around 750 formed infantry or 500 cavalry, though this can be scaled up or down depending on desire and availability of figures. Basing is open (you can use whatever basing you like as long as both sides are based to the same standard), but 40mm square bases or 2″ square bases are recommended for each stand. There is no set time or ground scale and no set figure scale, though given that each stand represents quite a few peeps, the smaller scales (3mm, 6mm, 10mm) are ideal if you want them to look the part. You will need quite a few stands if you want to fight some of the large battles that they offer scenarios for (there are three in this book, Issus, Trebia, Sabis, and a whole host of them in a second publication focused on the Punic Wars (all three of them, not just the second war)). Trebia, for example, requires 60-odd stands for each side. It can be played on a 6×4 table, unless you’re using 28mm figures, on which case you’re going to need a much larger boat. Er, table. Apart from the table and figures (and rules), you’re going to need to usual accoutrements, dice (in this case, 10 sided dice, a handful of them), measuring sticks / tapes, and some way of depicting diminishing morale (“demoralised” tokens are suggested, I will probably go with small flags stuck into the back of the bases, but you can always just use a roster too if you prefer that). There’s also the Morale Clock, which is used to track er…morale. As the clock winds down (each turn whoever receives the most casualties reduces their clock, and other events like deaths of generals or camps being sacked can reduce it too), your forces will find it harder to stick around until eventually the army breaks and flees. It’s a nice mechanic, allows customisable scenarios (the Romans at Trebia, having not had their breakfast and having just crossed a cold stream, start with a lower morale clock than the Carthaginians), and ensures that the game doesn’t go on forever. For the morale clock, you can use whatever you like, from writing down the relevant numbers of a sheet of paper, to using dice, or those little dial things that some people use for tracking casualties. One thing I liked was that even with this book being relatively short (which is another plus in my book), they still have a table of contents at the front and section on basic principles – I always like to see an author giving thought to these things, as it gives you an idea of the thought processes involved and themes the author wants to convey – and some designer’s notes. I’ve seen far too many rules sets over the decades where the author knows what he means, so he doesn’t feel the need to let you in on it as the reader. The basic principles mentioned include the points system used (which are very broad and intended for customisation depending on scenario rather than fixed army lists), generals (with colourful personality traits such as pious, stoic, noble origins, and drunkard, all of which affect some aspect of the game), pre-battle strategy (again, more later on this), the turn sequence (I go – You go), demoralisation (stands are removed when morale of that stand crashes, rather than trying to keep track of levels of casualties), skirmishing (which actually represents skirmishers well, as gadflies that screen your troops, hopefully inflict some damage on your opponent’s troops, and then either escape the field of battle or die without adversely affecting morale), and the afore-mentioned morale clock. The actual game mechanics are simple; each stand has just three statistics (Move, Combat, Rally) with an assortment of abilities and upgrades that affect certain aspects of battle. Abilities and upgrades can make all the difference; a unit with Roman Drill, Veterans, Pila and Heavy Armour facing an enemy that is Inexperienced and Unreliable is going to have a field day. Movement for most infantry is 4″ or 5″ (less in rough terrain) and 6″ to 8″ for cavalry (elephants are 4″), again affected by rough terrain. Terrain does play an important part, not just in movement; skirmishers and light infantry shine there; most formed infantry will slow down but can still fight effectively, pikes and the like will have a hard time of it). You probably won’t be able to get all your army moving, certainly not in the later stage of the game as formations break up and the confusion of battle sinks in, since the current number on the morale clock denotes how many stands (or groups of stands) can be moved in the turn. It’s a nice source of friction and uncertainty, and allows an opponent to take advantage and outmanoeuvre you in one part of the battlefield if you don’t pay attention (or if your morale is slipping away faster than theirs, like mine did). Combat factors range from 1 (the lowest, for skirmishers and rabble) to 5 (pikes and elephants), though this number is affected by a variety of factors (heavy horse charging get an additional +1, scythed chariots an additional +6), including terrain (cavalry tend to get -2 or so if in rough terrain) and morale. Rally factor varies from 5 (the lower the better) to 7 or even 8 for baggage trains. Combat is quick and simple, both for missile combat and melee. For missile fire, roll a D10 and consult a chart depending on the number of units firing; for a single unit firing, an 8+ demoralises (demoralised units can’t charge, and fight with a penalty), and an 11+ (artillery and elite units can add a bonus) results in an outright kill. Two demoralisation tokens leads to the unit retreating and a further combat penalty, and receiving a third DMZ token removes the stand. Range for missile fire is quite short (6″ for bows and slings, 12″ for artillery (ballistae and the like), 0 for javelins and pila, which are used as a factor in hand to hand combat). Hand to hand combat is a little different, in which both sides roll a D10 and add their combat factor. On a tie, they remain in contact; a loss results in a demoralisation token, and losing by double the score or more results in the stand being removed. There are a few factors which affect combat (flank and rear attacks, units having support, terrain and morale as previously mentioned), but these are easily remembered, and don’t require going through a long list of factors like some rules systems. In practice, both missile and melee combat led in our test game to mostly satisfying results; even troops will tend to go back and forth, but once the rots sets in, they’ll usually collapse, while uneven match-ups will tend to give the result expected, without the almost certainty of DB* games. If it is too swingy for your tastes, an optional rule suggests using a D8 instead of a D10. Sometimes you do get a plucky little stand of medium horse who thwart the pike block, or at least hold them in place long enough for your light horse to swing around and take them from the flank, which is always fun. Missile fire doesn’t tend to do to much harm, but it can really blunt an attack, and skirmishers are a definite plus if you can get a hit, stop your opponent from charging, then filter away to let your heavy infantry wade in against a demoralised enemy. If you’re really lucky, they’ll hang around long enough to get into your flanks while you’re busy dealing with the veterans to your front, as happened to me. An army without a skirmish screen is a dead army walking. Rally factor is the number you roll above when rallying (no, really! ), and if successful, removes your demoralisation tokens. Rallying removes *all* demoralisation tokens, so is pretty powerful, and any unit can do so if it has any, even if stuck in combat, which does seem a bit powerful. Units with a rally factor of 5 or less (some unit abilities and leaders joining units can affect it too) do tend to stick around for quite some time, though there is a penalty to the roll for each DMZ token that stand has. Still, if I impose any house rules, it might be to add an additional -1 penalty to the roll if the unit is still engaged (or even within a few inches of an unengaged enemy unit that can charge them). That’s pretty much the entirety of the game system in play, and it is fast playing in practice. There’s a good balance between when to throw a leader into the throng (to rally troops or to add a bonus to their combat factor), since they might come a cropper; can you risk losing that +2 /+2 general, or do you keep him safe (but thus not using his formidable ability)? Our game (about 1000-1100 points aside) lasted about 2 1/2 to 3 hours before my Romans collapsed, but that was with explanation and discussion of various rules and checking stuff. I’d say a force with twice as many points could easily be played in that same time after a game or two, which is the sweet spot for me. So what else is in the book? Quite a bit! There are three major facets that I have’nt yet discussed, these being terrain cards, stratagems, and siege warfare. First, terrain cards. There are 7 sheets of terrain cards in the pdf (and one of stratagems), which are used to create the battlefield if you aren’t modelling a particular historical battle. A deck of 50 cards (42 from the terrain cards, 8 from the stratagem cards) is created, which can be tailored to particular regions – Hannibal crossing the alps is likely to see a lot more rough ground and steep hills than somewhere nice and flat – and each player is dealt 9 cards. The (6×4) table is divided into 1′ squares, and each player take sit in turn to lay a card face down in a square (up to 2 cards per square, but you can’t play a card in a square already claimed by your opponent), starting on their base line, Each player plays 8 of their cards – the 9th is kept off table, usually a stratagem card if you receive any. You can only save one stratagem card in this way for play during the game, but excess stratagems can be used as a limited choice of terrain (which cover the usual clear, river, village / town, forest, hills, swamp, rough ground etc). The cards are then revealed one at a time, and a section of that terrain type placed in that square by the card owner. The battlefield is then ready for action. The terrain cards added a fun start to the game, and we both liked this part quite a lot – trying to guess whether your opponent was putting woods to guard his flanks and a nice clear stretch to his right or vice versa can lead to some tricky situations where at least one of you is going to have to go through terrain to reach the other, and there’s nothing quite like messing up their plans by adding a marsh right in the middle of their nice flat grasslands in their deployment area if they neglect to put anything there. Heh. Finally, the rules also contain a section of siege warfare that (at least on a read through) seems to work well. We didn’t try these rules (wanting to just use the basic rules to start with), but within about 3 pages, Greg has come up with some pretty good rules for dealing with sieges. There’s also a video tutorial on how they work which explains them pretty thoroughly in just a few minutes. This section even includes rules for amphibious landings! I went into these rules already expecting to like them having watched the videos that littlewarstv had made, since they tick my favourite boxes – quick, simple mechanics, focused on a particular period that I enjoy, and for large scale battles using small scale figures. After I’d read through them, I was enthusiastic to play to see if the actuality matched the theoretical, and I’m glad to say that it did. I’m looking forward to using these rules in the future, will cast a desirous eye on the accompanying Punic Wars scenario book until I scavenge enough money to get it, and already considering a campaign of Punic War battles based around the second Punic War (there’s a Sicily campaign in the scenario book for the first PW). I still love Sword and Spear when it comes to ancients rules, and will continue to use those too, but Age of Hannibal will see a lot of action too in the coming years. It’s a shame my current 15mm Punic and Successors armies are all based on S&S 80mm bases, looks like I’ll have to get more of the same in 6mm or 10mm to use on 40mm bases. Sigh. My thanks to Greg (and the other littlewarstvers) for these rules. I have the pdf rather than the hard copy (which is spiral bound so it can lie flat on the table). The cover is eye-catching, there are several period-specific pictures (mostly busts of various personages), and quite a few example diagrams, but you won’t find pictures of miniatures anywhere in these rules. They’re compact rather than verbose, well-laid out, well-written with ease of use in mind, and with explanations for decisions made or examples of play throughout. I think this deserves a solid 7. Age of Hannibal scores highly here, with the rules being easy to grasp, quick to learn, without too much looking up (we hardly checked the QRS after the first few turns, and seldom had to look stuff up in the book after the first time something new happened). It gave a satisfying game within our time frame too. A hefty 9. Very simple mechanics, while still highly customisable, and which give a result that doesn’t seem either too unexpected or overly pre-ordained. Javelin-armed skirmishers still seem a little underpowered (they’re almost certainly going to lose hand to hand combat, and since they only use their javelins then and not at range, they don’t tend to inflict any demoralisation), and that may be because of over-simplification in their case, but that shouldn’t detract from a nice system, and the morale clock is a nice facet of these rules. A worthy 8. While there’s nothing stopping these rules being used for other periods (the backbone is based on fantasy rules after all! ), and some will balk at the army lists (or rather, lack of them), these rules have been created for use in historical scenarios to a large extent, and it shows. Despite my gripes about javelin-armed skirmishers above, the use of skirmishers in this game does match nicely with their historical use, and there are several occasions in the rules where Greg comments on why the rules cover a situation in a particular way (such as the lack of standard command structures in other-than-Roman armies). Unlike with Sword and Spear, which made me want to start a dozen different armies immediately for all sorts of different periods and theatres, Age of Hannibal made me want to get working on a Punic Wars campaign in particular and to re-read up on the early 3rd C BCE. A well-earned 9. This is probably the hardest to factor in. While there’s a supplement already out covering scenarios for the Punic wars, and I would expect further similar offerings to come, there’s no forum or group dedicated to the rules (yet) – no yahoo group or google+ group, no mailing list, and you will have to work out army lists yourself (though you can use the example OOBs to do so quite easily). There is a facebook group, but that’s devoted to littlewarstv as a whole rather than AoH in particular, and likewise you can always comment on the youtube videos. I’m hoping that Greg will do something similar to his Altar of Freedom ACW rules, and offer free campaign sets as well as future larger scenario supplements, but that remains to be seen. On the other hand, there aren’t as many historical games companies out there that produce videos explaining how the games work, offering examples of play and with battle reports as littlewarstv does. I’m hesitant to say that Greg welcomes questions and comments by email (I don’t want him to get inundated with unwanted emails after saying that), but he was very helpful and pleasant to deal with when I’ve emailed him. That could, of course, just be because I’m wonderfully pleasant myself. Probably that, in fact. You probably shouldn’t bother him. It’s difficult to quantify this score – in traditional support, there’s a supplement and maybe more coming, but no forum for questions etc, and in untraditional support, the littlewarstv channel adds a great deal. I think I’ll give it a safe 7, though I do wonder if I’m undervaluing the youtube channel there. I reckon that out to be a total of 83, which if I were grading one of my students, would be an A-, on the cusp of an A. There’s not that much Greg could have done to improve on this score. Very highly recommended indeed. great review ! do you think you could make it out for a demo game sometime ? pity about the basing . Sometime soon-ish, sure. I mean, I could use big 80mm bases, but it’d mean a really big game, and I’m pretty sure I’d get tired moving all those big bases around, and I’m only about half your age. Nice overview, I’m going to have to check these out. You should do! Then get some nice 6mm figures rather than those 28mm ones you were talking about. Thanks for your review, Nick. I have played 3 games so far–Romans 2, Carthahooligans 1. Our club members liked AoH, and I am hosting a game of it at a local convention in January. You’re welcome! It’s a cool game, I’m looking forward to playing more in the new year myself. on January 26, 2019 at 7:26 am | Reply [Review] Baccus 6mm Punic Wars Range | Glory Eagles de l'Empereur!